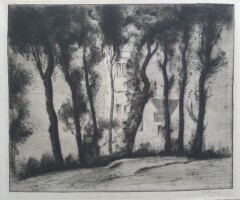 William Strang was taught etching by Alphonse Legros as a student at the Slade, 1876-1880 When Legros died Strang taught in his place and in the following two decades established his reputation as an etcher. In his long career he produced 751 etchings, some of which were for book illustrations. It was as an engraver that he was elected to the R.A. became a member of the Royal Society of Painter-Etchers from its inception in 1880/81. He exhibited regularly and later in life concentrated more on painting. As a friend of Ricketts and Shannon, he was a fellow member of the Society of Twelve. A fine portrait painter, Strang also had a strong social conscience. Draughtsman, printmaker, and painter, Strang was the son of the artist and etcher William Strang (1859-1921). Born in London, Ian Strang studied at the prestigious Slade School of Fine Art with Henry Tonks and then at the Academie Julien in Paris. Like his father Strang was a superb draughtsman and an etcher. However, his slightly austere style was his own and ran counter to the prevailing ‘decorative’ tendencies in continental art. His focus was landscape or, really ‘cityscape’. Strang worked in Belgium, France, Italy, Sicily, and Spain and taught at the British School in Rome. He was elected to the Royal Society of Painter-Etchers in 1930. Strang exhibited at the Royal Academy, the Royal Society of Painter-Etchers, and a number of important London galleries. His work remained at a consistently high level throughout his career and is represented in the British Museum, the Victoria and Albert Museum, the Imperial War Museum, and numerous other museum collections in Britain, the United States, and elsewhere.